Ferrari’s (NYSE:RACE) sales rose by nearly 11%, with the iconic luxury Italian Supercar firm shipping a total of 2,262 units, 216 more than in the same time frame of Y 2017. During this time, the company’s net revenues rose by 0.3%, whereas the net profit, as indicated in the results table below, went up by 105%. The biggest market for Ferrari since the beginning of the year was the EMEA (Europe, Middle East, Africa). They have shipped 3,181 vehicles in this region between January and September, up 8%, and 1,005 in Q-3, an 11% improvement. In the Americas, the luxury supercar maker’s sales went up by 5%, to 770 units, contributing to the overall sales since January reported at 2,189. 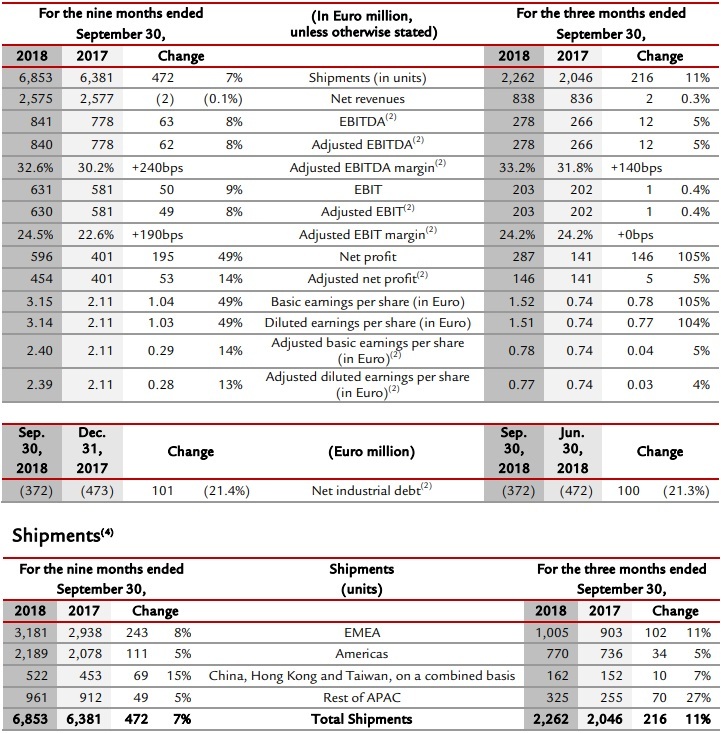 Another 522 Ferrari Supercars were shipped to China, Hong Kong and Taiwan combined since the beginning of the year, including 162 units in Q-3 In the rest of the APAC (Asia-Pacific) markets, 961 Ferraris found new buyers between January and September, including 325 sold in Q-3. All in all, total sales rose by 7% globally in the 1st 9 months of the year, for a total of 6,853 vehicles, out of which 2,262 were delivered between July and September. V8 and V12 sales were led by the Portofino and 812 Superfast, which witnessed an increased demand of 11 and 7.9%, respectively. The company is expected to 2X its earnings to €1.8-€2-B ($2-$2.3-B) by Y 2022 with the introduction of 15 new models, including Limited and Special Editions, hybrids and an FUV. I rate Ferrari Buy in here, because I believe the full scope of its earnings power is underappreciated by the market. Ferrari is the Aristocrat of the world’s automotive sector. Note: Ferrari’s stock market valuation is much higher than lesser mass market makers, so investors expect to see this reflected in the financial results. In Q-3 Ferrari’s average revenue per sale fell 8% to $310,000 thanks mainly to the entry level Portofino. But, the revenue from the sale of 1 of the new Monza’s from the Icona series equals the revenue per sale of 20 Portfolios.